Wishing you all a Wonderful Christmas and a Great Happy New Year! 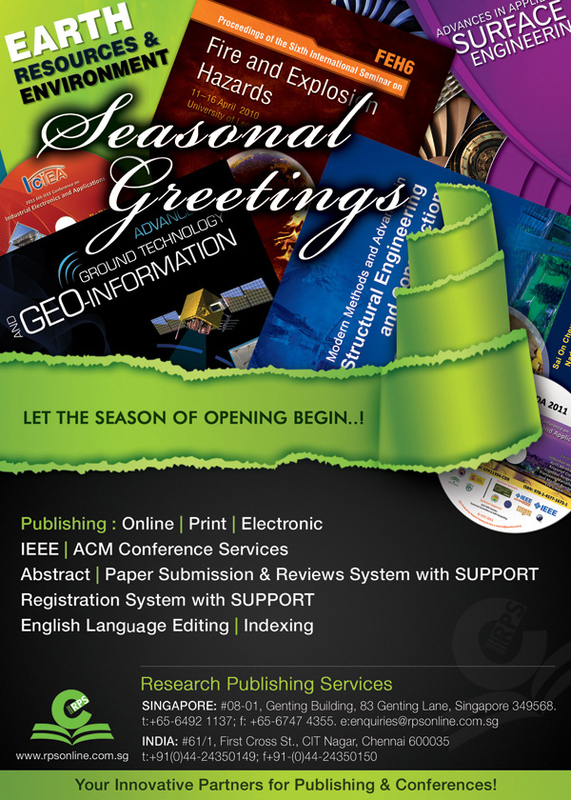 Japanese Geotechnical Society engages Research Publishing to publish its ICTGE2012 publications. Geotechnical Society of Singapore (GeoSS) entered into agreement with Research Publishing to publish his proceedings IS-AGTG 2012. Maritime Operations Specialty Symposium book have been adopted as a Text Book @ Australian Maritime College. RPS signed an publishing agreement with The ISEC Society to publish its prestegious conference publications. MRSS engages RPS to manage its forthcoming conference (MRSTC-2010) publications. RPS managed IEEE-ICGCIoT 2015 included @ IEEE's Digital Library. RPS managed IEEE-ICACCI 2015 included @ IEEE's Digital Library.